Complexes of hemoglobin and carbon dioxide have been known for a long time;(2) however, so far all researchers have regarded the oxygen uptake of the blood and its carbon dioxide uptake as two independent processes. Bohr found instead in the cited discussion that even though the carbon dioxide-uptake in the presence of oxygen remains uninfluenced, the oxygen uptake of the blood is usually reduced if a certain amount of carbon dioxide is present. However, from a quantitative point of view, the results were only reproducible with a relatively large error which may be due to great variability of the hemoglobin molecule. In previous work, we didn't utilize solutions of hemoglobin, but worked with fresh blood, which helped us to produce very constant results that are therefore relevant for the blood color based on heme,(3) but are not transferable without any modifications for artificially produced hemoglobin preparations. 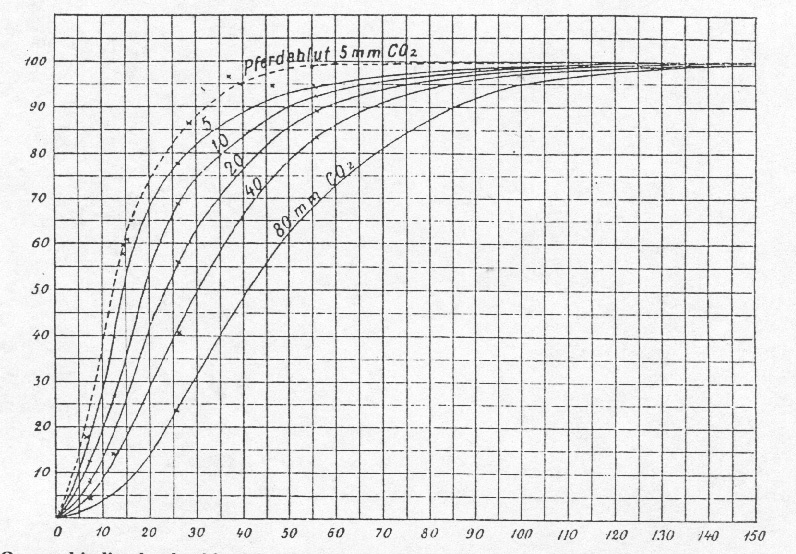 Those results previously published in Centralblatte für Physiologie (Jan. 30th 1904, Vol. 22) can be summarized as follows: carbon dioxide causes the oxygen binding of hemoglobin to decrease significantly at low partial pressure of oxygen. At a partial oxygen pressure of 150mm, almost no effect on oxygen binding can be observed. (4) Because all experiments so far that investigated the oxygen binding of hemoglobin have been carried out at a high partial oxygen pressure, this may account for the fact that the influence of carbon dioxide has been overlooked. Our investigations were carried out using fresh dog blood. Its coagulation was avoided by adding 0.1% potassium oxalate or by defibrination. Both methods gave the same results. Bacterial action was inhibited by adding 0.3% sodium fluoride in all cases. Between each assay, the blood was kept on ice. We showed by spectroscopic analysis after the experiment and evacuation that during the experiments no methemoglobin was produced. The experiments were carried out as follows: A blood sample was taken at an exactly known partial oxygen pressure and with as little carbon dioxide present as possible and was saturated with oxygen. We then determined the amount of oxygen uptake. Subsequently we added a corresponding amount of carbon dioxide and the measurement was repeated under the same partial oxygen pressure. The methods and apparatus we used were described in detail earlier. (5) The amount of oxygen, that was taken up when using 100 ml blood at an oxygen pressure of 150 mm and at a very low carbon dioxide concentration was defined as 100. All other values are expressed as percentages of this number. In doing so, we are able to compare blood samples of different concentrations, for example normal and anemic blood. Table I concerning Experiments I to IX. The amount of oxygen relative to 100 ml blood. The amount of oxygen absorbed by plasma has been subtracted. 10 March 1903. Normal Dog Blood. Iron = 45.9 mg/100 g of blood. Specific oxygen content = 378. 20 March 1903. Normal Dog Blood. Iron = 47.15 mg/100 g of blood. Specific oxygen content = 376. 24 March 1903. Anemic Dog Blood. Iron = 39.55 mg/100 g of blood. 15 May 1903. Anemic Dog Blood. Iron = 33.95 mg/100 g of blood. 19 May 1903. Normal Dog Blood. Iron = 47.2 mg/100 g of blood. 25 May 1903. Anemic Dog Blood. Iron = 28.3 mg/100 g of blood. 27 May 1903. Same Blood. 28 May 1903. Same Blood. 29 May 1903. Same Blood. Duplicate determination of the oxygen content at a carbon dioxide pressure of 150 mm. 10.52 and 10.53. In several of these assays we can clearly demonstrate the influence of carbon dioxide on the oxygen uptake. For example, in experiment IV, 2 to 3; here after the addition of carbon dioxide with a pressure of 90 mm the oxygen uptake of the blood decreased from 11.5 volume-percent to 4.7 volume-percent, whereas the oxygen pressure in the apparatus did rise from 26 mm to 33 mm. Similar results were obtained from experiment V, 2, 3 and 4 where we found at an almost constant oxygen pressure of 12.2 mm and carbon dioxide pressures of 10 mm, 28 mm and 54 mm oxygen amounts of 4.7 volume-percent, 3.0 volume-percent and 2.1 volume-percent. These results show, that the effect of carbon dioxide is not the same at every partial pressure of oxygen. Rather the effect of carbon dioxide decreases with rising oxygen pressure. For example, in experiment VI, 3 and 4 at a partial oxygen pressure of 55 mm increasing the carbon dioxide-pressure from 3 mm to 25 mm caused only a decrease in oxygen uptake from 10.4 volume-percent to 9.6 volume-percent and in experiment IV, 4 to 5 at an oxygen pressure of 150 mm a carbon dioxide-pressure of 75 mm only a decrease in oxygen uptake from 13.37 volume-percent to 13.31 volume-percent was observed, whereas the in experiment VII employed pressures of 150 mm to 270 mm carbon dioxide decreased the oxygen uptake at 150 mm from 10.9 volume-percent to 10.5 volume-percent and 10.0 volume-percent. The described phenomenon cannot be doubted(7) after having performed the described assays and it also follows clearly that the influence of carbon dioxide on hemoglobin is not of a permanent nature. After removal of carbon dioxide blood binds to oxygen in exactly the same amount as before, as for example shown in experiment IV, where the measurements of the same blood sample have been performed in the following order: 5, 2, 3 and 4. No. 5 and 4 were carried out at an oxygen pressure of 150 mm and show 13.37 volume-percent and 13.31 volume-percent oxygen in relation to the carbon dioxide-pressures of 1 mm and 75 mm. To derive more exact quantitative results from this data, it is necessary, to organize the assays in a way, that series of data are obtained, where the measurements were carried out at the same partial oxygen pressure and with varying carbon dioxide pressures. This is shown in Table II. 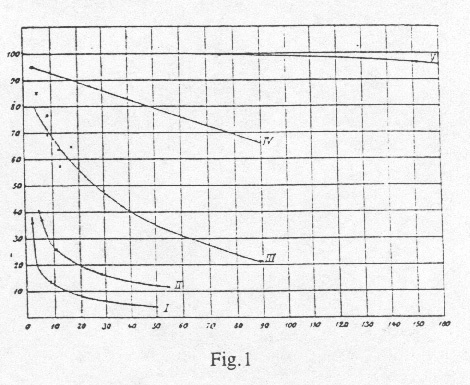 Subsequently for each of the investigated oxygen pressures (12 mm, 26 mm, 56 mm and 150 mm) curves are drawn. The x-axis represents the carbon dioxide-pressure and the y-axis represents the oxygen uptake (Fig. 1). By using graphic interpolation methods on these curves, we now generated a new group of curves (oxygen-pressure-curves) as in Fig.2. Every curve corresponds here to a different constant carbon dioxide-pressure. The x-axis represents the different oxygen-pressures and the y-axis represents the oxygen uptake. Since it was impossible, to maintain an absolutely constant oxygen pressure during a series of experiments with different carbon dioxide-pressures, it was necessary to introduce a correction factor to our observed values. All values were group-wise reduced to exactly the same oxygen-pressure using the previously obtained oxygen-pressure-curves. The corrections are relatively small, and it was therefore possible, to correct our data using our preliminary curves without causing any significant error. The corrected values were then used exactly as described for the observed values to produce our final result as shown in Fig.1, Fig. 2 and Table IV. The following table shows, that it was possible to obtain very good consistency in between the curves showing the calculated oxygen pressure and the observed oxygen pressure for the influence of carbon dioxide. The following table shows the values, that determine the curves. No. O2 Obs. O2 Calc. No. O2 Obs. O2 Calc. It is to be noted, however, that curves and tables are only completely true for 38C and dog blood. Blood from other mammals behaves very similar qualitatively with oxygen and carbon dioxide, but the relative binding is not completely identical since the blood components may vary. Specifically for horse blood we found, that the curves in general are a little bit elevated compared to dog blood. This is expressed in Fig. 2, where a pointed curve shows the oxygen uptake of horse blood at a carbon dioxide-pressure of 5 mm. The measurements, this curve is based on, were carried out as described previously(8 and the values have been corrected for the carbon dioxide-pressure of 5 mm. We will not discuss the investigated relationship theoretically. (9) We will only point out that we could not observe any influence of the oxygen pressure on the carbon dioxide binding of blood. If such an effect exists at all, it is certainly of a very minor nature. Figure 2. Oxygen binding by dog blood (solid lines) and horse blood (dashed line) as a function of oxygen partial pressure at different partial pressures of carbon dioxide. Table IV. Oxygen uptake in percent at various combinations of oxygen and carbon dioxide partial pressures. The biological significance of the negative influence of the carbon dioxide pressure on the oxygen binding of blood is obviously very big. Our results show, that even a high partial pressure of carbon dioxide in the lungs will have no significant effect on the oxygen uptake, since the oxygen pressure here will be very high. During the bloods movement through the body the oxygen-pressure will decrease to a relatively low value, whereas at the same time the carbon dioxide-pressure rises. This will greatly support the oxygen release from the blood, resulting in an improved efficiency in oxygen usage. Let us assume an oxygen pressure of 25 mm in the veins. Assuming carbon dioxide had no influence on the oxygen binding, only 24% of the amount of oxygen present in blood could be transported to the plasma and from there on. But if the carbon dioxide pressure increased at the same time to 40 mm or 80 mm, 60% or 78% of the oxygen could be transferred, without requiring the oxygen pressure to fall below 25 mm. The carbon dioxide pressure of the blood is therefore to be regarded as an important factor in the inner respiratory metabolism, which itself can be regulated by it in a very effective way. Furthermore our experiments help to explain different observations on the supporting effect of carbon dioxide in cases of oxygen lack: If one uses carbon dioxide in appropriate amounts, the oxygen uptake of the lungs will not be influenced, whereas the oxygen, that was taken up can be used more effectively throughout the body. 2. Chr. Bohr, Beiträge zur Lehre von den Kohlensäureverbindungen, Dies Archiv. 3, 47 (1891). 3. Chr. Bohr, Die Saurestoffe des genuinen Blutfarbstoffes und des aus dem Blute darstellten Hämoglobins. Centralbl. für Physiol. 23, (13 February 1904). 4. A. Krogh, Apparate und Methoden zur Bestimmung der Aufnahme von Gasen im Blute bei verschiedenen Spannungen der Gase. Dies Archiv. 16, 390. 5. Werigo (Arch. De Physiol. (5) X.3, 610) did assume that carbondioxide and oxygen compete for binding on hemoglobin without showing this experimentally. This assumption, which in no way, as Werigo thinks, can be derived from the existance of a CO2-hemoglobin complex (experimentally shown by Bohr) is not correct [Dies Archiv. 3, 64 (1891)]. 6. The oxygen binding of blood decreased slowly with time , even though no hemoglobin production was observed. That at 150 mm was not observed on the 27th, we assumed, that the real amount was somewhere in between that on the 27th measured 11.00 and that on the 28th measured 10.80. 7. In Centralblatt für Physiol. (May 1904, Vol 18) Krogh described the utilization of a machine, which made it possible to show the influence of carbon dioxide on blood by observing color changes. Addition of carbon dioxide to still light-red blood cells causes blackening. Using this apparatus it was possible to show as well, that the carbon dioxide-induced change in blood color is not of permanent nature. 8. Krogh, Apparate und Methoden. Dies Archiv. 16, 390. 9. Concerning this see: Bohr, Theoretische Behandlung der quantitativen Verhättnisse der Kohlensäurebindiung des Hämoglobins. Centralblatt für Physiol. 27 Feb. 1904. Vol. 24. Return to Department's Home Page, Course Home Page, Course Syllabus. Last updated 9 January 2004 by Hal White.